i hope you enjoy what you SEE, HEAR, and FEEL here while browsing. - don't forget to take proper credits when taking info, okay?? are nominees for TVXQ Toplist. Please help us get more votes by voting for us! and show your love and support. the miracle can happen in just one click. LET'S SHINE CASSIOPEIA AND MAKE OURSELVES HEARD! [CASSPH] A reply to those who read "My fandom redefined." don't worry, this would be a lot shorter than my novel-like one. when reposting, please put proper credits. thank you. i'm posting this as a general reply to those who read my blog post (see here) on supporting TVXQ here in the Philippines and took it quite negatively >.< but there are those that i want to commend who voiced out honest opinions and laid them down clear and concise without a hint of "ranting mode". straight to my point, i never said that voting in MYX (or any local music chart for that matter) is the ONLY way you could show your love and support for our beloved boys. i never said that when you don't vote for them then you're a lesser kind of a fan anymore. we have different definitions on how to become a fan to TVXQ, it's just that this is how i define myself as a "real fan" (where real = full support and love all the way) and i'm not enforcing anyone to be like me after reading my blog post. of course there is a hint of influence in between the lines of my post, but in the end it is still your decision to be moved or not. i'm glad that most of you were enlightened with what i wrote, although there are still those who are still in gray about it, but i know there is still time and i'm not giving up on them. there is still hope for every cassph member just as there is still hope for TVXQ. personally, i don't want to use the word "fan" anymore because i think most of us has gone beyond the wiki definition of "---a person with an intense, occasionally overwhelming liking and enthusiasm for something.". the word has a derogatory effect that it is only an extreme case of obsession. but for our experiences with TVXQ, i beg to disagree with that definition. an obsession can wear out and die after a few years, but to have love, unconditional love, involved will give it a whole new meaning. and yes, WE ALL LOVE TVXQ WITH ALL HEARTS. like i said, "Faith makes all things possible.... love makes all things easy." so thank you all for reading my blog post and keep the faith eternally! be warned: this blog post is a "no bars held" post. this means that i have stated some things that in one way or another, might hurt your feelings as fans. but it was never my attention to. i just want to make a strong calling that we should set aside our differences and be one, for real, as cassiopeia, as fans of dbsk. be open. be reflective. and be happy that you are a part of cassiopeia. repost if you want. just give proper credits to yceamaecy@cassph.info. my sister and i had a fandom talk while sadly sulking at Wrong Number's rank in MIT. sis: "i thought you guys are all out in supporting them?" me: "yeah, we are, but we don't enforce it to our members, we still leave it to their own decision if they want to vote or not." sis: "do you really have to think about that? i'm not an all-out kpop fan but i do recognize that DBSK deserves a much higher rank in that chart. if you would remember, i wasn't an Asian music fan not until i met DBSK. you should consider that fact." me: "i know T~T but people still have their own opinions regarding the spread of DBSK here in the Philippines." sis: "opinion? seriously, DBSK doesn't need opinion right now. what they need is love from you. they need every support you can give. from what i know, you love a person without setting yourself a limit. you give support because they deserve it. You guys know that right?" sis: "you guys are the only hope of DBSK to get together again. if SMEnt would feel that big demand on DBSK in the Philippines, considering every entertainment aspect (radio, tv, media), i think they would pretty much consider getting them together again. me: "well, we are relying on Avex to bring them as Tohoshinki. besides, that possibility of DBSK coming as DBSK would only mean a very low percent in regards to the present situation." sis: "but despite that low percentage, will you really disregard that small chance of getting DBSK together?" sis: "then you better be more vigilant in defining yourselves Cassiopeia as Cassiopeia." our conversation really brought me to tears. and take note, my sister is 5 years younger than me. i came to realize, how do you really define yourself as Cassiopeia? how do you define yourself as a fan of DBSK/Tohoshinki/TVXQ? do you give yourself limits on being a fan? or you give them your all? being in this fandom is hard. we all know that. besides that, we also have our own opinions, and i respect every opinion that i come across. but this time, i guess i have to give a little push. i know some of you guys don't really feel like voting in the MIT Chart, or making DBSK's music popular for that matter. we have our different opinions regarding this one. some positive, others are negative, and i respect that no doubt. but i guess i have to make my point clear here. ranking in a music chart, be it a local or international, says a lot in an artist's influence. take for example, the Oricon Chart. we know that it only applies to Japan but whenever DBSK rank first it means something to us right? and it also means something to the korean fans, especially to them. we know that DBSK can't be active together in korea, and the only happiness that we could give those korean cassiopeians is the fact that we still appreciate the guys and give them support through and through. here in the philippines we are finally given a chance to do it in our own way. we don't have to travel to Japan and Korea to show our support for them. we can show it to them by making people know who DBSK is through their music and talent. we can finally make our own voice to let people know why are they known around the world. and we can do this by voting for them in the MIT chart. Why the MIT chart? because it is on national tv, and national means the whole population will be watching them. it's an instant information dissemination. now from this point on i know i'm going to hear comments about DBSK having more "fans" and that there will be more competitors for them, or there will be posers who will say that "i'm also a fan and i know TVSQ (<--i did that on purpose) too", or there will be people who would mock them and say that they are "jologs" and cheap because they are kpop and that we are just concerned on what DBSK will feel if they hear those comments. i respect all those reasons because as i said, we have our own personalities towards this fandom. but after saying all those, didn't you realize that it was all pointing towards yourself? i can relate to all those statements because i admit, i was like that before. i never wanted anyone to have a share of this fandom because i feel special, because there are only a few ones who know about DBSK. if they start to be famous then everyone else will know about them and everyone else will know and sing their songs and music. then i'm not special anymore. but come to think of it, DBSK were never choosey in terms of sharing their music right? they never said that their songs are just for koreans or for japanese only. they write, compose and sing songs for everyone to hear. it now depends on us if we will appreciate it or not, and we did. that goes for everyone else. remember that we also started as clueless people who know nothing about kpop who eventually appreciated it despite the language and the culture. i became a fan since they debuted last 2003, so imagine my thoughts back then when i meet fans who just became a fan like 1-3 years ago. i don't like the thought of having those fans because i know more about them. i was a real elitist. but when i watched DBSK's experience in Japan and how they started from zero to none. that they have to disregard every award and recognition they got from korea and establish themselves all over again, it hit me. if DBSK were humble enough to accept such situation, why can't i? eventually i became more open to fans who are new to the fandom and got really interested on how they were able to know DBSK, and i'm happy that i did. regarding the posers and the mockery, the reality is we just have to live with it. posers do come and go, but the mockery is everywhere. aren't we tough enough to receive the worst and most hurtful comment that they would say against DBSK and us? you might say that we just don't want those people to mock our lovable guys, but do you think DBSK themselves would easily sulk up when they hear those things? they've heard worse, much worse, and even experienced the worst things from their antifans in korea, but what did they do? they disregarded every single thing that was said and done against them and remained humble. as simple as that. i know that we can also do that, because i have faith in every philippine cassiopeia. we just have to prove to them all wrong by being more persistent in showing them who DBSK is and what they are made up of. it can start by a sense of curiosity. when DBSK will gloriously rank number 1 in the MIT chart, they would start to wonder who they are. in effect, they will do their own research on them, get to know them a little better and talk about them which will become a domino effect which will eventually spread among their friends, their friends' friends and the whole Philippines! imagine if DBSK would hear the news that they ranked number 1 in the music and album charts despite their hiatus and in a country where they never had a promotion... they would be happy right? and their happiness is the utmost importance in our life as cassiopeia. So please~ support them in any way you can. Vote for them in MYX MIT chart, buy their albums and share the music. Please let us leave out all the insecurities and personal opinions behind us and for once be a real Cassiopeia who will support them in heart, mind and soul. and take note, my sister's 5 years younger than me. i know some of you guys don't really feel like voting in the MIT Chart. we have our different opinions regarding this one. some positive, others are negative, and i respect that no doubt. but i guess i have to make my point clear here. we can show it to them by making people know who DBSK is through their music and talent. we can finally make our own voice to let people know why are they known around the world. in we can do this by voting for them in the MIT chart. Why the MIT chart? because it is on national tv, and national means the whole population will be watching them. it's an instant information dessemination. So please~ support them in any way you can. Vote for them in MYX MIT CHART and buy their albums. Please let us leave out all the insecurities and personal opinions behind us and for once be a real Cassiopeia who will support them in heart, mind and soul. Just a few minutes ago, Universal Records Philippines announced that they are going to release Tohoshinki's Best Album. The versions that are going to be released are the TOHOSHINKI "BEST SELECTION 2010" 2CD+DVD EDITION and TOHOSHINKI "BEST SELECTION 2010" CD ONLY EDITION. It is roughly perceived that they are going to release it this March. When this happens, I hope, I really, really hope, that you guys are going to support it 110%. You don't have to buy both versions, but if you can, please do. As everybody can read in every kpop and jpop online news, TVXQ is gaining a lot of limelight all around the world despite their hiatus, unlike here in the Philippines sadly T~T. It would be really great if we make a big impact on the sales of the Best Album because it has just been recently released in Japan too. If Avex Trax heard of this great news on album sales, SOMETHING GOOD MIGHT ACTUALLY HAPPEN in the following months. Yes, those caps are meant to be capslocked. So please, support it when it is released. [CASSPH CAMPAIGN] MIROTIC live album: GOLD record status soon! Our goal is to make it the 1st Kpop album to reach gold here in the Philippines w/in 1 month & to make it #1 on its 1st week! okay, first of all, i'm not totally biased with my blog title. saturday morning, 7 am, i kissed my parents goodbye as i left for alabang. yeah, i know. i'm a good kid, hehehe. i arrived at about a little past 8 am and caught up with miki setting up the booth. we put up tables for each booth and started fixing our own booth. berna and i were covering the table with red and black cloth and putting them in place with everybody's bestfriend, double-sided tape. yes, we all did "harass" Junsu. added the fact that his crotch was stained. Hannah, what did you do with him back in the car?? so after spazzing over Junsu, the HoMin and JaeChun tarps came! and they were really big too! too big to fit. so we cut them out by piece and managed to hang them around the booth's perimeters. from time to time, people were asking for a time check. but we didn't notice it was getting closer to 10 am not until we saw a line outside the event place already! major time pressure. the gates were opened and people flooded across the whole floor! literally! we stood our ground and faced the avid, excited and ecstatic fans head on. the first few hours was a struggle. it was kinda hard making the visitors calm down first when they saw Junsu, hehehe. then the problem with the shirts having no size labels and loose change came up. we were opening the shirts and comparing them to each other to tell its size and it was taking a lot of time >.< we still have to tend to the membership, ticket stamping, fansign and postcard too! plus the people in front of the booth were nowhere from diminishing in number. i was really thankful when the twins arrived. Miwha and Mitchi. two beautiful lifesavers. i have additional hands to help on the shirts and membership forms. and when you say beautiful, what do you think happened? yep. a flock of interested guys and curious photographers. LOL. i actually asked the girls if they were already used to this kind of attention. they said it's kinda normal already, but they do not tolerate harassment. Miwha would probably kick their asses if someone dared to. the AKTF shirt set was a hit! it was like selling pancakes! we were so excited about having so much sales that we forgot to take note of the pre-orders' separate stock! we so fail in this part! mianhae! but i think there were two people who didn't get their order due to no available sizes already... wah, i'm really sorry! ~ there was a girl who literally fangirled the twins! super! ~ there were guys who were really desperate in getting close to the twins that they joined in making a postcard for TVXQ. i caught this postcard that wrote: FIGHTING CHANG-MING! i totally LOLed on this and even asked the guys to point who is Changmin in the tarp. they pointed their hands in different directions! LOLOL. ~ Yunho and Changmin actually came to the booth! they are not tintin and berna. i swear. the after party/dinner was a breather! whew! it was then we realized how successful the event was. the attendees, participants, performers, sponsors, media partners, FCs, volunteers and of course, the CORE. the KPOPCON is coming up! for your help in promoting this big event! sites, blogs, facebook, multiply, forums etc. we will be grateful for every effort you'll give in this! thank you and see you in the KPOPCON! TVXQ (often stylized TVXQ! 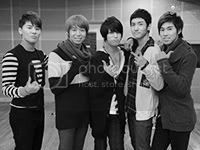 or TVfXQ), an acronym for Tong Vfang Xien Qi (東方神起), is a quintet South Korean boy band formed under SM Entertainment in 2003. In South Korea they are known as Dong Bang Shin Ki or Dong Bang Shin Gi (동방신기). 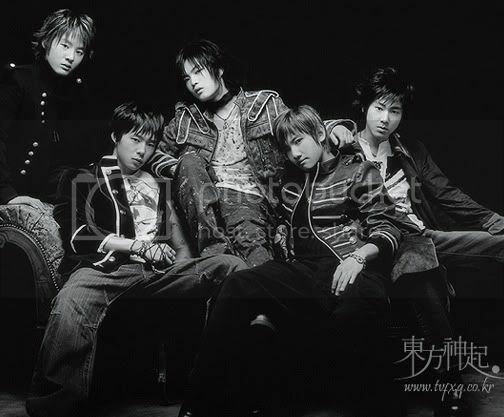 They were later introduced in Japan as Tōhōshinki (東方神起, Tōhōshinki) under Avex sub label, Rhythm Zone in 2005. Their name roughly translates as "Rising Gods of the East". TVXQ, the acronym based on the Chinese counterpart of their name, is the abbreviation officially used on all products and advertisements outside of Japan. Since their debut, TVXQ has become one of the most popular singing groups in East Asia, gaining great popularity in such countries as China, Singapore, Thailand, and other East Asian regions.